Marvel at the modern and historical highlights of Dubai on this 5-hour private tour, with a flexible itinerary that can be tailored to your interests. As you travel by air-conditioned vehicle with your own private guide, discover engaging facts about this futuristic metropolis. View landmarks such as Atlantis The Palm, admire the Burj Al Arab hotel, ride an ‘abra’ water taxi on Dubai Creek and visit souks, malls and Dubai Aquarium. Finish with a visit to the 124th-floor observation deck on the Burj Khalifa to witness the jaw-dropping, 360-degree views. See whatever you want in Dubai and visit the Burj Khalifa afterward, with private transport between the sites. We thought we were going to experience a private guided tour. Instead our guide handed us tickets and we got into a 25 minute line with everyone else for our trip up the elevators. The process is very organized but a long line for sure. Then when the elevator doors open on the viewing platform you just wander at your own pace. When you are ready to descend you once again get into a 20 mi Ute ride don to the exit. To sure where the private guide part was. However we were met by our guide when we exited and enjoyed the rest of our tour. Dubai is an amazing city with an interesting blend of old and new. We booked a private tour and probably saw the main things to see. But our guide showed up a hour late (after our hotel had to call repeatedly and we had confirmed before we left.) and his heart wasn't really into it. Still, if you have a day a city tour is well worth the time. Wir hatten einen Stop Over in Dubai und haben diese Tour gebucht. Unser Guide Ramy hat uns bei unserem Hotel abgeholt. Er sprach sehr gut Deutsch und hat uns Dubai sehr nahe gebracht. Er erzählte uns auch viel über das Land und die Menschen die da Leben und Arbeiten. Wir, eine 5 Köpfige Gruppe von 16J, 46J, 50J, 54J, 75Jährig fühlten uns alle Pudelwohl. :- ! 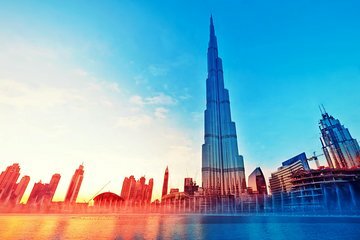 Für alle die einen Aufenthalt in Dubai habe ist diese Agentur und genau das Richtige. We did not receive the excursion as stated our private guide made changes to it which we where not happy with. I told him I wanted the tour as stated and gave him my print out. He dropped us off at the gold market and left us unattended in an area that I did not feel safe in for far to long. I told him I was not interested in shopping at all he still left us and made us get out of the car. He tried to take us to a art museum which was not on the tour and I told he no way as I do not like art museums. He left us one and half hours earlier than he was suppose to. This is the first time with Viator I was not happy with the tour and I have taken at least a dozen. I do not recommend this tour at all. I did contact Viator and was given a partial refund which did not make up for this as it was a birthday present from my husband!!! This was a terrible tour, the description of this tour was very different to what we actually got. There was no wifi and no drinks, the driver only spoke to my husband in the front seat, the 3 females in the back were ignored. The driver barely spoke he was more a driver than a tour guide, I would not recommend that anyone take this tour, there must be better tours out there, we had some taxi drivers who did a better job. It all started with my tour guide arriving 20 min late. No effort was made to call me to let me know that he was running late. The guide barely spoke English and repeated everything five times. His car stunk of cigarette smoke. As for the tour itself, I would not recommend it - it is mostly driving by sights and stopping to take a picture here and there than anything else. Yes, I was given 20 min at the gold souk, but it was a miserable experience as it is impossible to just walk around there without being followed and harassed non-stop - unless you are looking to buy ugly gold jewelry, it is definitely a stop to be skipped. The rest is driving around the city stopping to take pictures with well-known sights in the background - that's about it. The final stop is being dropped off at the Burj Khalifa with a ticket in your hand - well, my ticket was for 1.5 hours after I was dropped off there. The guide was able to haggle to get me up sooner, but what great planning on the company's part! Overall, I would definitely not recommend this tour. The weather was not good during our stay, in fact it rained and was very overcast and cold. The driver was prompt at collecting our party of 4 at our hotel and we drove out into the city to view the new architectural buildings together with the old style Dubai. We visited the spice and gold markets together with an indoor market and the guide was very informative and answered a lot of questions about life in Dubai. We were then left at the Mall once our guide had purchased out Burj Khalifa tickets he left us here to end our day. The view was somewhat restricted due to the rain and cloud but nevertheless an experience not to be missed. We were then able to look around the huge shopping mall as long as we wanted and made our own way back to our hotel by taxi as agreed previously. The tour takes in most of Dubai and as we had a private tour we were able to stop and take photos when we wanted. Overall a good day out. This was a great tour that alowed us to use just one night to get around and see the city most of it was from a car and a lot of shopping but was still a nice person to take us and the end at the dubai mall at Burj Khalief was excellent and well done. I would recommend the day trip instead of the afternoon because of traffic.